Ever wondered how light is transformed into electrical signals in our eyes or how our bodies recognise and react to chemicals or foreign bodies? It all comes down to phosphorylation, which occurs when a protein known as a kinase attaches a phosphate group to another protein, changing the structure of the phosphorylated protein to either activate or deactivate it. This brief moment sets off a chain of instructions as the activation or deactivation will produce a signal for yet another protein, altering the behaviour of the cell. These signalling pathways play important roles in many biological processes and diseases so there is a lot of interest in discovering phosphorylation sites on proteins and possibly leveraging them as biomarkers or targets for new medicines. Traditionally, to find these sites, mass spectrometry is used to either smash proteins apart or apply electrons to carefully dismantle them. Our team has taken the best bits of both these approaches to create a new hybrid technique. The main tool used to identify and quantify proteins and their post translational modifications, of which phosphorylation is one type, is mass spectrometry. In a typical experiment proteins are extracted from a biological sample and digested into smaller chains of amino acids called peptides. This highly complex mixture is usually separated by liquid chromatography before undergoing mass spectrometry. The peptides are ionised (given an electrical charge) and sprayed into the mass spectrometer, where they pass through various electrical fields that accelerate and separate them by size and amount of charge. These ions are then detected and converted into a spectrum, this is known as MS1. 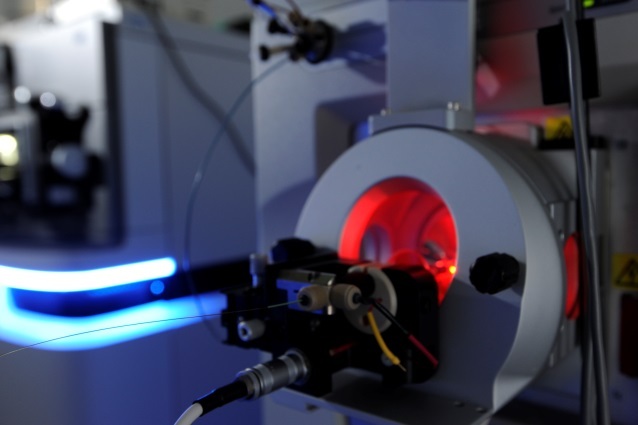 For each peptide ion, the mass spectrometer detects it then tries to isolate and break it into smaller fragments, producing a second mass spectrum known as MS2. The MS2 spectrum is used to find the amino acid composition of the peptide, and any modifications present. By matching identified peptide sequences to a database of known protein sequences we can identify the proteins in our original sample and maybe even quantify them. There are several ways that a mass spectrometer can fragment peptides to produce the MS2 spectra. The most common is collision induced dissociation , in which peptide ions are given lots of energy so they collide with inert gaseous molecules such as helium or nitrogen and fragment; this is a fast reaction but also quite harsh, like hitting the peptide with a hammer. This leads to problems when looking for phosphorylations as it causes them to fall off the peptide so we cannot detect the original sites of modification. Another fragmentation method, electron transfer dissociation, uses electrons to target amino acid bonds and fragment the peptide, comparable to cutting the peptide up with scissors. This method is slower than collision induced dissociation but is also softer and preserves the phosphorylation modification sites. Recently, our lab has developed a method in which we harness the speed of collision induced dissociation and the softer fragmentation of electron transfer dissociation by combining them in the same experiment. We use collision induced dissociation to quickly fragment all peptides and if the mass spectrometer detects a loose phosphorylation (known as a neutral loss) it automatically switches to using electron transfer dissociation fragmentation so we can locate the amino acid that was phosphorylated. Using the new method, combined with some analysis software improvements including a machine-learning method to improve peptide and protein identification, we have been able to increase the number of phosphorylation sites we have detected and increase our confidence that the sites are accurate. We hope it will provide a useful method for the future study of phosphorylations. James Wright is a senior bioinformatician in the Proteomic Mass Spectrometry team at the Wellcome Trust Sanger Institute. Proteomic Mass Spectrometry team at the Wellcome Trust Sanger Institute. ← Non-allelic homologous recombination: inheritance or chance?